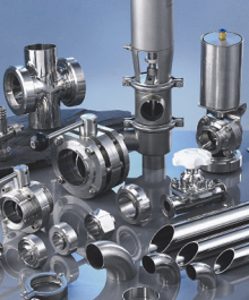 Our Hygienic Tube and Fittings come in both Grades 304L & 316L from 1/2”Ø to 4” Ø. Available As-Welded & Descaled, Annealed & polished or Bright Annealed, we supply an extensive range to ensure we meet your needs. From Fitted Bends, Tees, and Reducers to Clamps & Tube Hangers Unions, we supply a variety of adaptors, valves and fittings. We work closely with our trusted suppliers to ensure our material meets the RJT, IDF & DIN Metrics to 300mm OD.